Posted on February 1, 2019 by Staff & filed under Nevada by the Numbers Blog. 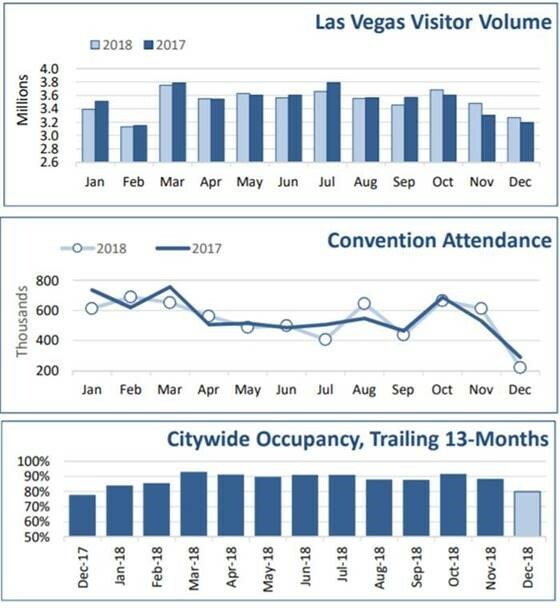 The Las Vegas Convention and Visitor’s Authority (or “LVCVA”) has released their December 2018 tourism executive summary, and we have the most interesting numbers for you here. While we didn’t quite match 2017’s 42.2 million visitors for the year, it came close: just over 42.1 million visitors came to Las Vegas in 2018. Convention attendance was also lower than the year before, with 6.5 million attendees, or 2.2 percent lower than in 2017. LVCVA credits this drop to tradeshows rotating their conventions away from Vegas. The occupancy rate for all of 2018 was 88.2 percent, .5 percent lower than in 2017. Digging into those occupancy numbers, though, that was due to drops in both Strip Occupancy(-0.7 percent) and Mid-Week Occupancy (-0.5 percent), while Downtown Occupancy held strong and Weekend Occupancy grew by 0.2 percent. You can find the full report on the LVCVA website.